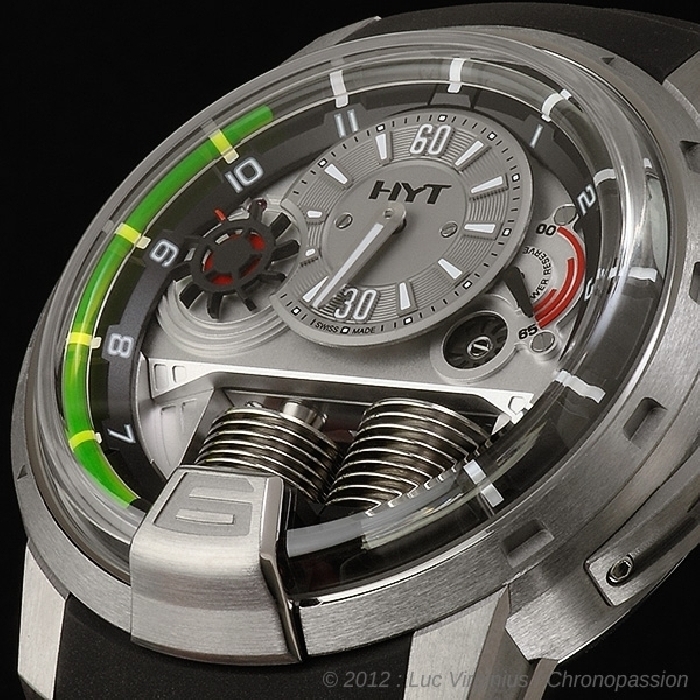 HYT | 50'000 € Tax inc.
H1 : HYDRO MECHANICS We knew about clepsydras or water clocks. The oldest found thus far dates back to the age of the pharaohs. It took 3400 years to overcome the force of gravity and indicate the time with a liquid in a mechanical wristwatch. 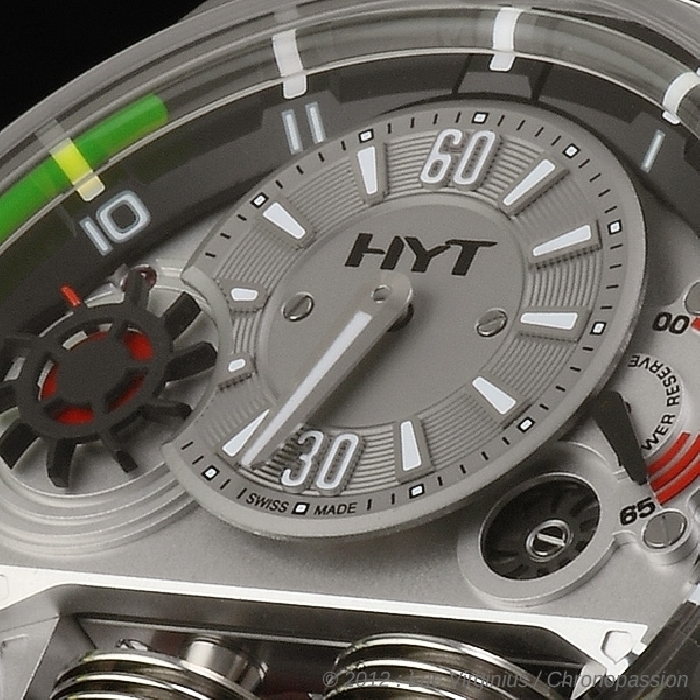 Many have dreamt of it – HYT has done it. 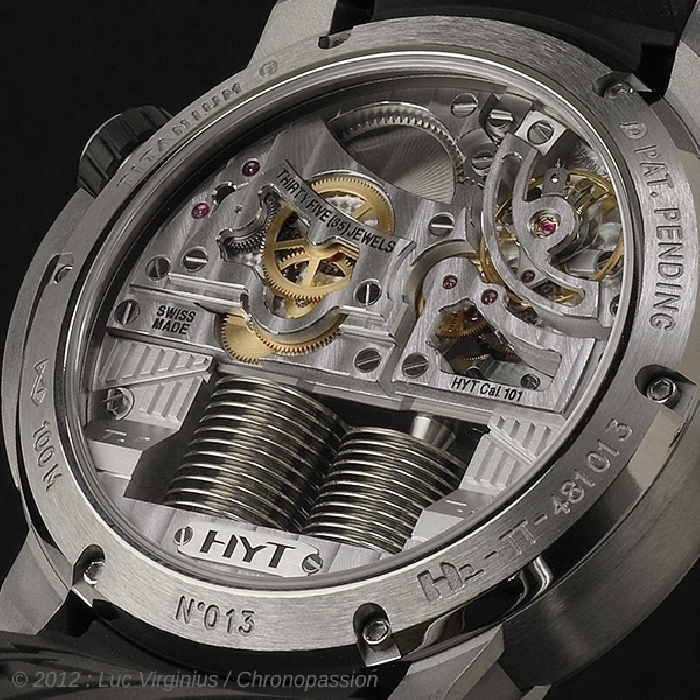 The principle An encounter between Fine Watchmaking and fluid mechanics. One might say a utopia. Shattering all certainties, steamrollering conformity, the idea that led to the H1 was simple and consisted of two flexible reservoirs fixed to each end of a capillary. In one was an aqueous liquid filled with fluorescein, and in the other, a transparent viscous liquid. To keep them separate: the repulsive force of the molecules in each liquid, with a meniscus to mark the boundary between the two. The two reservoirs at 06:00. While the first compresses, the second expands, and the other way round, resulting in the movement of the liquid in the capillary. As the hours go by, the fluorescent liquid advances. The meniscus, in the shape of a half moon, marks the breaking point with the other fluid in the tube, indicating the time. At 18:00, the fluorescent liquid comes back to its original position, going backwards. The secret that gets the reservoirs going? Two bellows made of a highly resistant, flexible electro-deposited alloy, each driven by a piston. And this is where watchmaking comes in to activate the system. 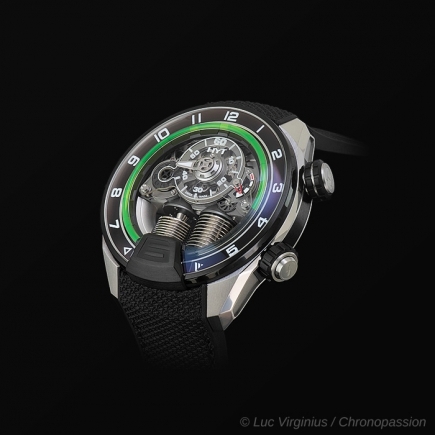 A mechanical movement to activate the hydro system Orchestrated by Bruno Moutarlier, alongside Jean-François Mojon and his Chronode SA team, a mechanical movement is situated in the upper part of the watch, and propels a cam, which pushes the piston and activates the bellows. 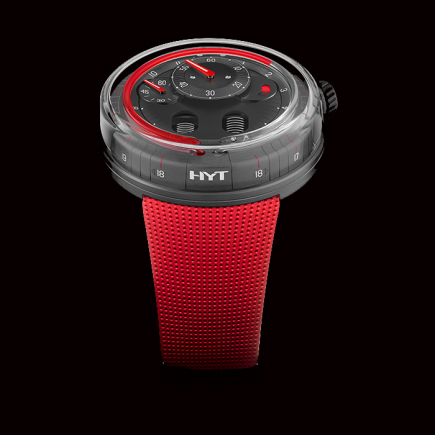 The main challenge lay in finding an interface between the mechanical movement and the hydro system in a closed, waterproof circuit – a task further complicated by the limited space available to house them both. They had to be assembled separately to keep them independent, and then made to operate simultaneously. This is a highly delicate modular integration, which involves other constraints, such as the installation of the dial in two parts, through the sides. From concept to reality: the convergence of two worlds with a common aim While the basic idea is simple, realising it is highly complex. 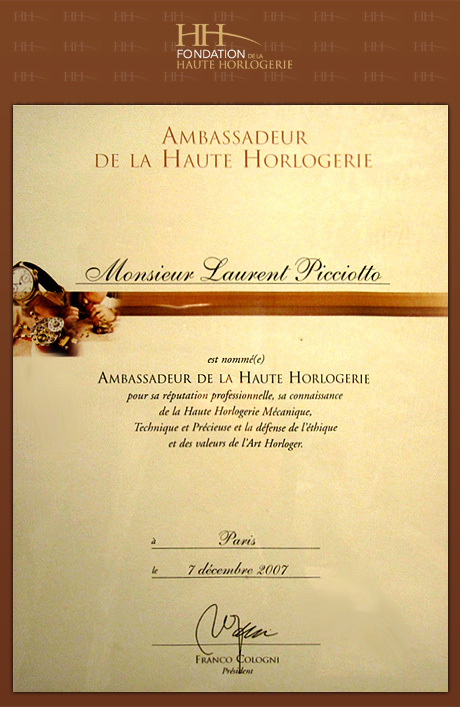 Led by Bruno Moutarlier, two teams worked together. 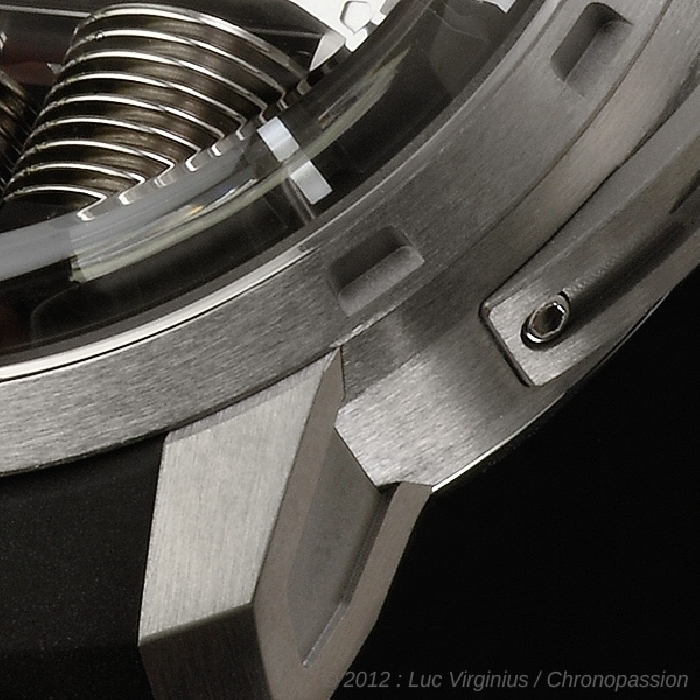 On the watchmaking front were Jean-François Mojon and his supporting team at Chronode. 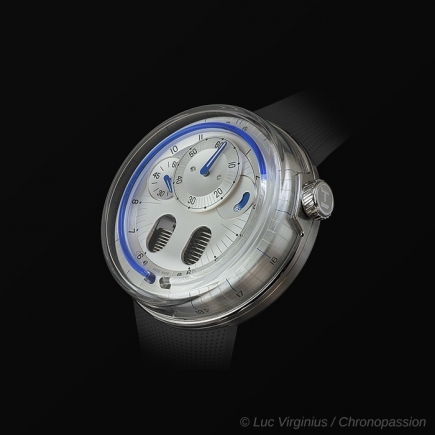 Working on the fluid operation was Preciflex, the patent registration company created by the founders of HYT – Patrick Berdoz, Lucien Vouillamoz and Emmanuel Savioz. Supporting Preciflex was Helbling Technik, from the medical world, where fluid motion is used in certain treatments. An incredible human adventure that propelled two worlds in principle at odds with each other towards a new joint era – that in which a unique technology would rock not only watchmaking but also medtech, because the pump system would lead the way for brand-new applications in that field. Exploration bordering on nanotechnology Step 1: develop liquids that obey a set of watchmaking specifications. Colour, homogenous texture, resistant to vibrations, shocks and temperature changes, no alteration in the long term, foolproof water resistance. Needs that require the development of a number of innovations. Up till now, seven patents have been registered for the technology and one for the design. This was a steep plunge into the unknown, which led to technical watch- making feats bordering on nanotechnologies. Mastering the energy requirements Hydraulic force means pressure. When the fluorescein-loaded liquid has done a complete round and gets to 06:00 – 18:00, the issuing pump compresses, while the bellows receiver expands, generating resistance and consequently an increased energy requirement. To fix this, Preciflex developed revolutionary bellows made from an extremely fine alloy and which are highly supple and resistant. 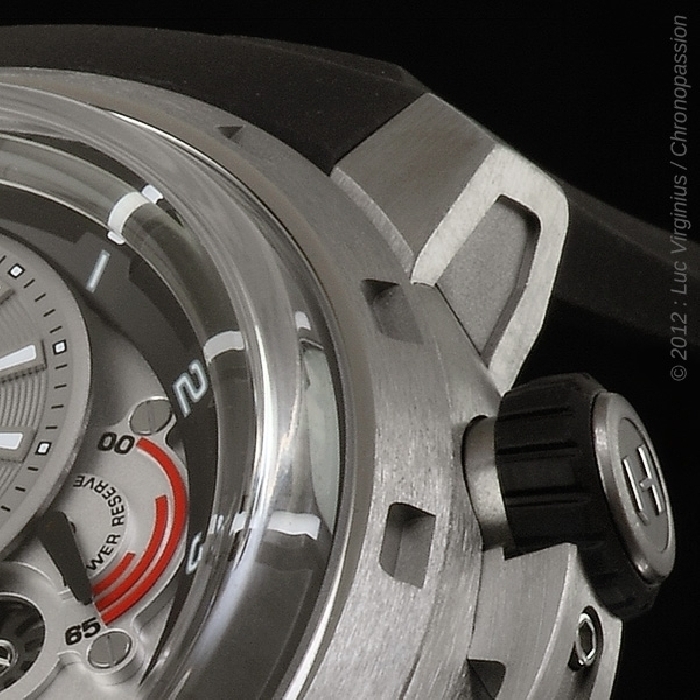 They are in fact inspired by the sensors used by NASA and their design had to be adapted to watchmaking requirements. Their specially researched shape allows for the reduction of energy required for their compression, absorbs shocks and ensures rock solid waterproofing. Metaphysics of fluids During the entire development process, alongside the engineering, the amounts of liquid were the focus of great attention. Every microlitre counts, and the total volume in the closed circuit is extremely precise, as the system has to have a nanotechnology-worthy level of water resistance. Due to the unusual link between the crown and the liquid, a special time-setting system was designed in order to avoid the liquid moving around too fast and damaging the meniscus. An emotional accelerator The taut, aggressive design by Sébastien Perret dictates the testosterone-laden nature of the H1. A completely non-standard construction. Three-dimensional architecture viewed just as well from the front as from the side or three-quarters through a sculptural 5mm sapphire crystal carved from the block, itself topped by a dome at 6 o’clock imposing its own rules. Particles of fluorescein spring from it, like sparks flying off the passing hours. The industrious pistons and bellows converge toward it. 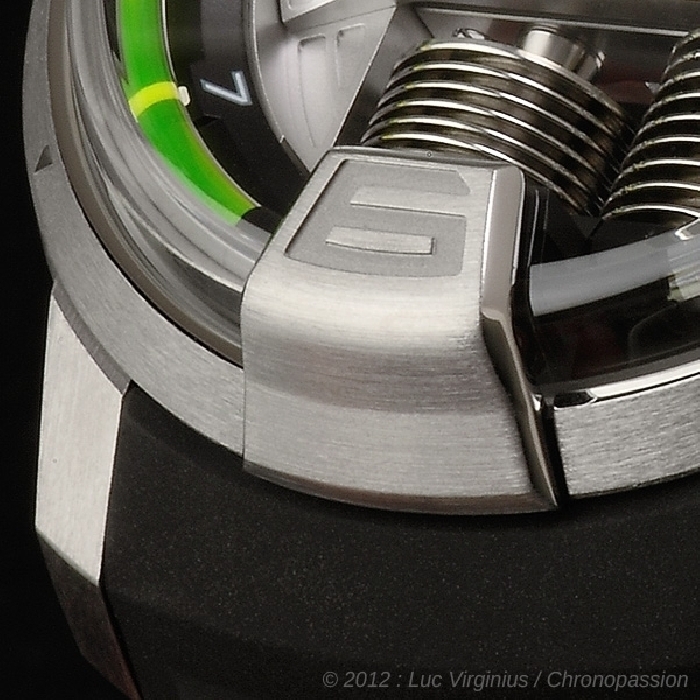 The apparently unstructured upper part of the watch dictates a geometric design composed of strata and reliefs. 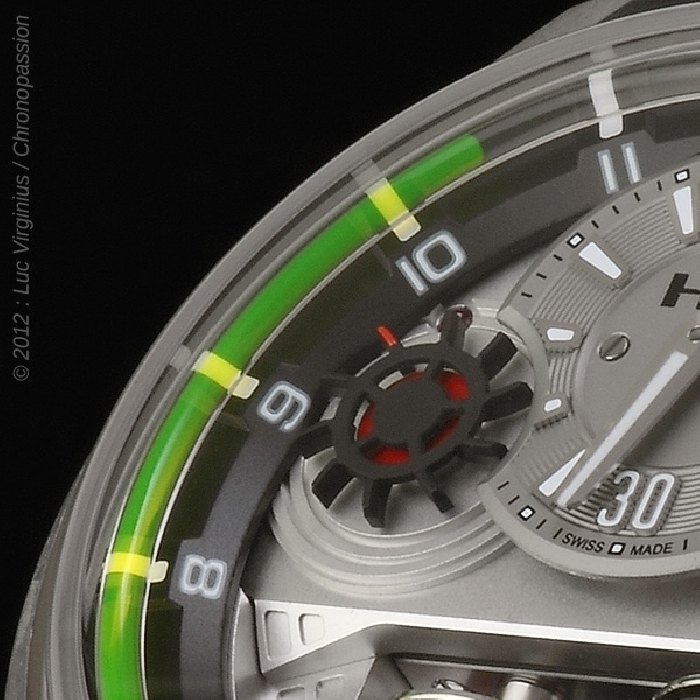 In the centre sits the minute regulator, overlapped by a spectacular small seconds display resembling a water wheel. At 02.30, a 65-hour power-reserve hand indicates the remai- ning energy available across three arcs of a circle. And meanwhile, the fluids follow their course around the case.